The modest style and good laughs of this sleeper hit will be just as funny in your living room as in a theater full of moviegoers. A highly recommended rental. A modest, personable slice of South Side Chicago life, "Barbershop" is a comedy with a sense of community, populated by three-dimensional personalities that break out of their character molds. Ice Cube stars as Calvin Palmer, the reluctant inheritor of his family's tonsorial storefront -- a neighborhood staple for 40-plus years which is now losing enough money that Calvin is secretly considering selling. A habitual get-rich-quick schemer, he thinks he'll make a better living setting up a garage-sale-supplied recording studio in his basement. Facing a possible foreclosure after bank loans don't come through to keep the shop afloat, Calvin is beginning to think a $20,000 buyout offer from a greasy local loan shark (who wants to turn the place into a "gentlemen's club") is sounding pretty good. But over the course of one day in the shop, he finally begins to see why his father and grandfather were so willing to struggle to keep the place alive as a touchstone for their depressed part of town. Writer Mark Brown takes an admirable step up from the insultingly shallow and simplistic men-are-dogs comedies "Two Can Play That Game" and "How To Be a Player" with this story that has something meaningful to say -- without becoming preachy -- about preserving tradition, maintaining local history, and retaining hope in a bleak city tract through community altruism. First-time director Tim Story (who cut his teeth on music videos but somehow avoided becoming afflicted with cinematic attention deficit disorder) struggles a little with a slapsticky secondary plot about two burglars (Anthony Anderson and Lahmard J. Tate) trying to bust open an ATM machine they swiped. He also fails to patch some logical loopholes in Brown's script: If the shop is struggling, why is it full of customers most of the time? And why does Calvin have six other barbers working for him? 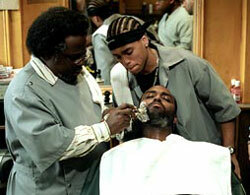 OK, one of them is an ex-con (Michael Ealy) trying to straighten out his life and Calvin wanted to give him a leg up. And another is local color -- an entertainingly blustery old coot with a monster afro (played with bit-chomping delight by stand-up comedian Cedric the Entertainer) -- who has been a staple in the shop since Calvin's grandfather opened in 1958. But why keep the white gansta wannabe (Troy Garity) around? What about the girl barber (played by rapper Eve) who keeps going back to her cheating boyfriend? What about the insecure African immigrant (Leonard Howze) with no significant role in the shop or the film? And what is the young, college-educated elitist (Sean Patrick Thomas) even doing there when he wears his diploma on his sleeve like a badge that gives him license to pontificate? Well, I mean, aside from getting into amusing arguments with the old coot and the wannabe? But these plot impediments don't hurt the movie much because hidden depths emerge within all these characters as the picture plays on, and Story puts almost everyone to good use servicing the film's comedy and conviction. Cube, sans his action movie scowl, gives a very good performance that anchors "Barbershop" soundly in sincere and philosophical sentimentality. But Cedric steals the show with his under-his-breath off-color asides and bombastic rants. Watching him go on a politically incorrect jag about Rodney King, O.J. Simpson, Rosa Parks and slavery reparations is a can't-believe-your-ears laugh almost worth the price of admission by itself.